Every now and again, my freezer becomes so full that the door barely shuts. Obviously, this is a sub-optimal condition for a freezer to be in, so something has to come out before something else goes in. Yesterday, the thing that had to give was a shortcrust tart case – too bulky, too awkward and basically it was just getting in the way of the complicated packing sequence needed to stuff the maximum into my freezer. So, some sort of tart or torte had to be made. Fairly quickly.
. It’s a blessedly simple method of making a classic French apple tart, made even easier by the presence of the ready made pastry case in the freezer. Bourdain’s recipes are proper kitchen recipes – they’ve got a paired down quality to them, trimmed of any superfluous steps or unnecessary messing about. You’re getting the essence of the dish from Bourdain, and that’s a very good thing. A tarte Alsacienne it is, then. For the pastry case, just follow this recipe. It’s a dependable, time-honoured method that won’t fail you. 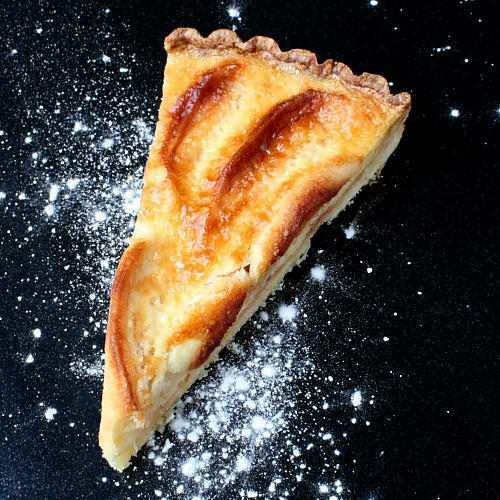 For this tarte Alsacienne, you need to cook the pastry case before filling it because the filling is liquid. To do this, simply take a solidly frozen pastry case and put it straight into a 180c oven for about twelve minutes or so, until it’s lightly browned. Don’t mess around with this step – straight out of the freezer, straight into the oven without a second to spare. If you do this, your pastry case won’t rise up, shrink or otherwise misbehave. When the case has cooked, set it to one side and let it cool. Next for the apples. Core and peel four Golden Delicious apples, halve them and slice them into 1cm slices. I’m not generally a fan of the Golden Delicious – it’s an apple for people who don’t like apples, and lacks depth of flavour and character, but for this sort of dish, it’s perfect…fairly sweet and holds its shape through the cooking. Line a baking sheet with greaseproof paper and grease it with a good tablespoon of butter, then evenly sprinkle with a tablespoon of golden caster sugar before arranging the apple slices on it in a single layer. Sprinkle another tablespoon of sugar over the top of the apples and cut two tablespoons of hard butter into small chunks and dot all over the apples. Put the tray into a warm, 150c oven for forty minutes until the apples are soft but haven’t collapsed. You need something to glue everything together and to fill the tart out. You could use frangipane, but in this case, it’s going to be a custard. Frangipane would be superb, come to think of it…maybe next time. Whisk together four eggs and 35g of golden caster sugar until the sugar is completely dissolved. Bring 110ml of double cream, 110ml of milk and a teaspoon of vanilla extract to a gentle boil in a small saucepan. Take the milk and cream from the heat and very slowly pour it into the egg mixture, whisking all the time. An electric whisk definitely helps here. The mixture will thicken very slightly. This is good. Arrange the cooked apple slices in a circular pattern in the cooked pastry case, in the way that a highly skilled and rigorously trained Parisienne pastry chef would and place the pie tin on a baking tray. This makes everything easier to handle, and catches any spills in the oven. Put the baking tray, pie crust, apples and all into an oven pre-heated to 180c and slide out the oven rack halfway. Carefully pour the custard over the apples until the tart is full but not overflowing. Slowly push the wire rack back into the oven and bake for twenty-five minutes or until the custard has set. Allow to cool before removing the tin and slicing. What a classic apple tart. Looks so incredibly tasty. Great photo too! I think I need to do this. I will put on my excellent, trained, pastry chef hat and pray. Looks too enticing. Gorgeous! Pitch perfect recipe with stunning photos! What is the minimum ammount of sugar I have to put in to still get a sweet custard without overdoing the sugar? 350g sounds like a lot. My gut feeling tells me anything between 100-200g might suffice. You'd need to experiment a bit to find the minimum you could get away with. Remember, though, that the apples can be quite tart and acidic, do the sugar isn't there just to sweeten the custard. That looks amazing. I love apple tarts and fell in love with frangipanes this summer so I'll have to give this a try. Thanks for sharing the recipe!